Dessert – Don't Forget the Cream! Life – Gluten free and delicious. Everyone must know by now how much my family likes cheesecake, so I make at least one a week. Seriously, at least one. I also like to try different flavors. This one is quite tasty and I must admit the idea to use Irish Cream came after I already added the heavy cream, so please feel free to skip the heavy cream and increase the amount of Irish Cream for a fuller flavor. You can see in the photo the white “topping” layer. Do not skip this step. 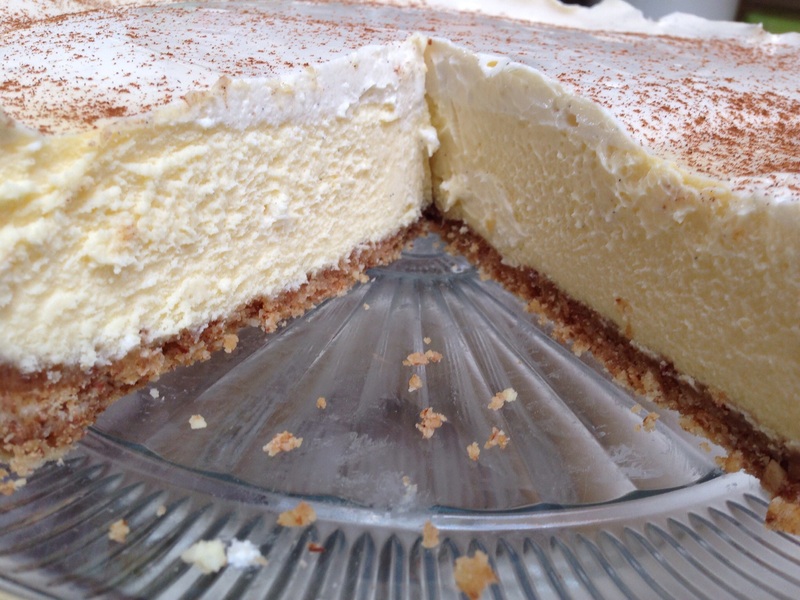 I add it to nearly every cheesecake that I make and it adds a little something to the flavor while also avoiding a plain, flat cheesecake top which can detract from the creamy goodness below. 3 pkgs. Philadelphia Brand Cream Cheese (full fat only), at room temp. 1. Preheat the oven to 350°. Prepare a 8″ springform pan by wrapping the outside with plastic wrap, then again with foil. You will be baking the cheesecake in a water bath, so it is imperative to keep the water from seeping in. You can stop here, but I also line the inside with parchment paper. This is tricky to write, but here goes. Take a long piece parchment and place it on the bottom of the springform pan; then, put the bottom into the round from the bottom, the parchment should remain relatively flat. Snap the springform and then wrap with saran and foil. This makes it easier to slid off of the bottom and onto your serving plate but it unnecessary if you don’t care to do it. Bake for 12-15 minutes or unitl set and beginning to brown. Set on a rack to cool, do not remove the wrapping. 2. In a food processor, add your cookies and process until it is in small crumbs. Move to a bowl and process the nuts until the same size as the cookie crumbs. Add to the bowl. Add the brown sugar and mix until well incorporated. Stream in the melted butter and continue mixing until fully incorporated. Press into the bottom of the prepared pan and if there is enough, partially up the sides. Bake at 350 Degrees for 12-15 minutes or until set. Allow to fully cool to room temperature. Do not refrigerate. 3. In a small bowl, mix the sour cream sugar and Irish Cream and set aside, covered, on the counter. You want this at room temperature when you put it on the cheesecake. 4. Heat the oven to 325° (note that the oven is cooler than when baking the crust) and place your baking pan (not the crust, the pan that will hold the water and crust; I use a large roaster) in the over to warm. In a stand mixer, add the cream cheese and sugar, blend for several minutes until smooth. Scrape down the sides and bottom every minute or so. The smoother your filling as you mix, the creamier your cheesecake will be. Add the almond extract while still mixing. Scrape the sides again, and add the cream in a slow stream. Continue mixing and scraping, and add the Irish Cream. When fully incorporated and smooth, add the eggs – one at a time – and continue mixing. Be sure to crack the eggs, 1 by 1, into a measuring cup or small bowl to be sure that none of the shell accidentally falls into the mixing bowl. Pour the cheesecake into the prepared pan and place the pan into the roasting pan that is also preheated. Add boiling water to the roasting pan taking care not to get any water into the cheesecake batter. Put enough water to come 1/3 of the way up the sides of the cheesecake. Bake for 60-75 minutes. Open the door of the oven and pull the cheesecake out. The sides will be firm, but the center of the cheesecake will giggle slightly, truly slightly, when you tap the side with a wooden spoon. 5. Immediately pour the room temperature topping on the cheesecake, smooth it out with an offset knife and return to the oven for 10 minutes. Remove from the oven and from the water bath. Immediately place on a cooling rack and remove the foil/plastic wrap. Don’t burn yourself, but take the wrapping off as soon as possible as it will be holding water. Allow to cool for an hour then refrigerate until fully cooled before cutting, at least 6 hours, but better if you can refrigerate for 8 before cutting. 6. Run an offset knive around the edge fo the ring, and unsnap. Remove the ring and move the cheesecake to your serving platter. I grated a little fresh nutmeg over the top. Serve alone, or with an additional topping of your choice. 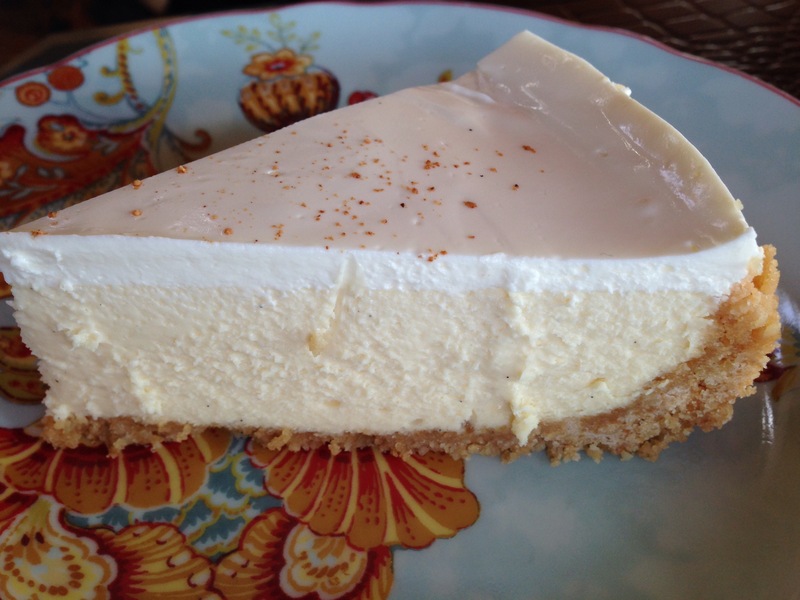 This cheesecake pairs nicely wth a caramel drizzel and a nice cup of espresso. 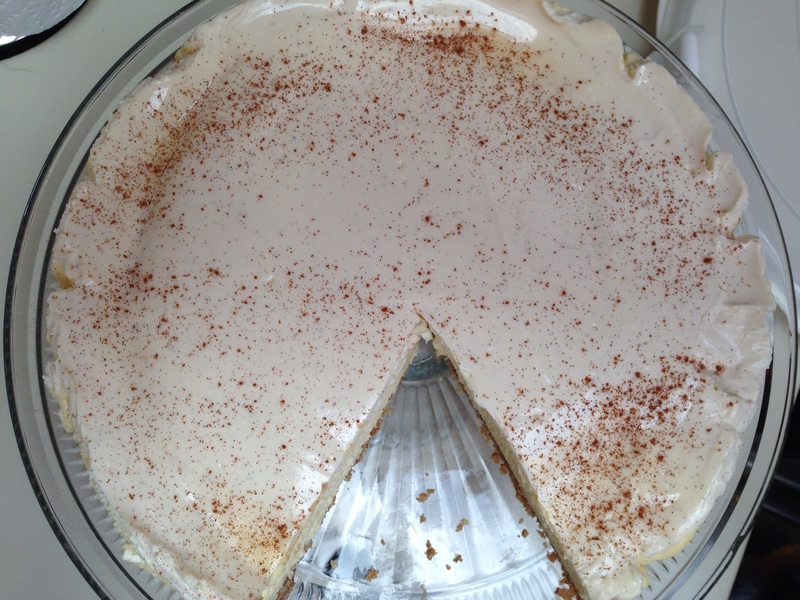 Vanilla Cheesecake with a Shortbread and Almond Crust – and it is gluten-free. Cheesecake is so fabulous that I’m considering giving it its own category. From preparing the pan to having the patience for the right technique to toppings. It all matters and when the individual parts come together you will have created a creamy, cool, delicious and highly adaptable dessert that nearly everyone will love! And when someone tells you that they don’t like cheesecake assure them that they just haven’t tried the right one for them yet! A cheesecake can be dressed for a hot day in the sun with some fresh lemon curd (see related post) or for thanksgiving with my related pumpkin version. You can make a raspberry swirl topped with dark chocolate Grenache or an Almond Joy the flavor options are endless, and if you have a request for a flavor combination send it over to me in my Cooks Q&A Section and I’ll work it out for you. I just sold myself, here comes a new category. Two actually, it will be in Tea Parties also. Back to the cheesecake. The basics: only use full fat cream cheese. This is not the time or place for a low-fat version. It just doesn’t work. If you’re going to make a cheesecake, do it right. If you want to count calories, go for a walk with a pedometer 😝and a dog🐶. Both you and Fido will be happy! But I digress….to the recipe! 4 pkgs. Philadelphia Brand Cream Cheese (full fat only), room temp. 1. Preheat the oven to 325°. Prepare a 9″ springform pan by wrapping the outside with plastic wrap, then again with foil. You will be baking the cheesecake in a water bath, so it is imperative to keep the water from seeping in. You can stop here, but I also line the inside with parchment paper. Grease the bottom and the insides of the walls with butter, then roll your parchment in a cone shape and cut to make a big circle. Press the parchment into the buttered pan and it will stick. 3. In a small bowl, mix the sour cream with 1/4 cup the sugar and 1 teaspoon of the vanilla bean paste and set aside. If you refrigerate, be sure to bring it back to room temperature before adding to the cheesecake. 4. Heat the oven to 325°. Add all of the cream cheese and 1 1/4 c. sugar to a stand mixer fitted with the paddle. Mix on low, #2 or 3 until incorporated. Scrape down the sides frequently. This step is critical to creaminess. Add the vanilla bean paste until incorporated. Scrape the sides and add the cream in a slow stream. When incorporated, add the eggs one at a time and continue mixing. Be sure to crack the eggs, 1 by 1, into a measuring cup or small bowl to be sure that none of the shell accidentally falls into the mixing bowl. Add 1/4 tsp. of almond extract and continue mixing. Zest about 1/2 of a lemon into the mixing bowl. Be sure to not get any of the white pith from the lemon, it is bitter. Pour the cheesecake into the prepared pan and place the pan into a larger roasting pan. Add boiling water to the roasting pan taking care not to get any water into the cheesecake batter. Put enough water to come 1/3 to 1/2 way up the sides of the cheesecake. Bake for 60-75 minutes. Open the door of the oven and pull the cheesecake out. The sides will be firm, but the center of the cheesecake will giggle slightly. 5. Immediately pour the room temperature topping on the cheesecake, smooth it out with an offset knife and return to the oven for 10 minutes (A bit longer, 15 minutes, if the topping is cold). Remove from the oven and from the water bath. If you did not use parchment paper, run an offset knife around the edge. Allow to cool on a rack for about an hour, then refrigerate until fully cooled before cutting, about 4 hours. 6. Remove the ring from the springform pan and move the cheesecake to a cake plate before serving. Serve with a topping of your choice, I like serving it with lemon curd, see my related recipe in the “tea party” section if you would like to try it this way. To me, a curd is lumpy, but not this recipe for traditional lemon curd. This is smooth and lemony without being overly tart. It is great on desserts, cookies, waffles and in hot tea (try it!). It is quite nice to have on hand and can be added to sauces for a citrus kick or in your salad dressings. I am a shameless fan of high and low teas, and lemon curds is a must at both on your crumpets and tea cookies. I’m working on an entire section of tea party recipes, this is my introduction offering. It is quick, easy, and will last for the better part is two weeks if you take care not to contaminate the lemon curd while using it. Wash the lemons to remove any chemicals, dirt or wax then thoroughly dry. Remove the zest (the yellow part of the rind) from the lemons using a zester or a peeler (be careful to avoid getting any of the white pith, it is bitter Yes, I know this is the second warning, it is that important). Juice the lemons after removing the zest. In a medium saucepan over medium-high heat, combine lemon zest, lemon juice, and sugar. Bring just to a boil; reduce heat to medium-low and simmer 5 minutes. Add butter and stir until it has melted. Remove from heat and cool to room temperature. Beat eggs into cooled lemon mixture until well blended. Return to heat and cook over medium-low heat, stirring constantly, 10 to 15 minutes or until mixture thickens and coats spoon. NOTE: Do not let the lemon curd boil, as it will cause the mixture to curdle and that cannot be fixed. Remove from heat, allow to reach room temperature. The lemon curd will continue to thicken as it cools. Once it reaches room temp, you can refrigerate. 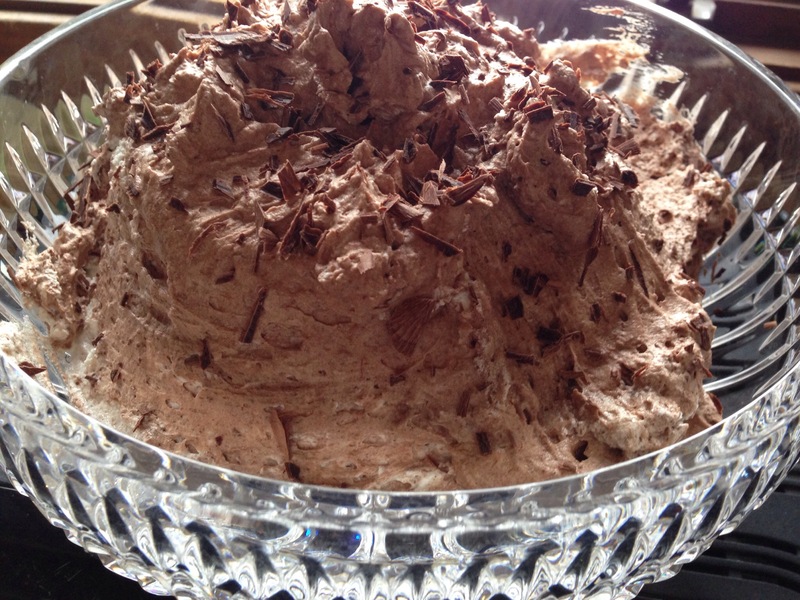 Elegant, cool, velvety, chocolatey mousse. Mmmmmmousse (eyes dreamily closed). Now for my personal disclaimer, I am not a big fan of chocolate. SAY WHAT? That’s right, I prefer the saltier side of life. Give me a potato chip over a candy bar every day of the week. Even so, every now and then a nice bit of chocolaty sweetness sooths the soul. And the darker the chocolate and smoother the feel, the happier I am. Voila! The answer is this chocolate mousse. Of course, as this is merely one of hundreds of recipes that you can find for this whipped treat, you can easily modify it to your liking. It doesn’t even have to be chocolate! Nope, it does not. I will explain later. Oh, and while I shaved chocolate on the top I do not recommend doing so and I will refrain in the future. “Why?” you ask…well, let me quickly explain. It makes it lumpy. That’s it. Pretty for the picture, but not the tongue. I don’t want little bits of chocolate and I will never do it again. Maybe a dusting of….STOP. No. Nothing on top. Maybe a drop of whipped cream with a little raspberry liqueur infused into it. Now that’s how to top mousse. But I digress. As always. To the recipe! If you have a stand mixer, feel free to use it, but I just use my hand mixer fitted with the whip. Some folks use both beaters, but this recipe seems to turn out better with the whip. 1. Whip the cream, sugar and vanilla in a metal bowl nested over a bowl of ice water until very stiff peaks form. I begin whipping on #3, then increase the speed as the cream thickens. It usually takes 5-6 minutes, but the cream will show you when it is ready. The chilled bowl is important, the ice water nested bowl will allow you to let the cream sit on the counter while you make the rest of the recipe. Alternatively, you can chill the metal bowl and when the whipped cream is done, just put it into the refrigerator to keep it cold. 2. In a double boiler, or a metal bowl over gently boiling water, melt the chocolate and add the espresso when it becomes liquidy. Do this slowly and remove the pot from the heat just before all the chocolate is melted. Give it a few nice stirs and allow the chocolate to melt into itself slowly. You do not want this to happen over high heat/steam but gently. Cover with a plate or lid and set aside. It must cool, but not to room temperature. You want to keep the chocolate in liquid form, but no so hot that it cools into little hard pieces when added to the eggs. 3. In a third metal or glass bowl, whip the egg whites until soft peaks form and there is no liquid to be found at the bottom of the bowl. I like using my stand mixer for this, but that’s because my arm is already tired from the whipped cream. If you use a hand mixer, again, use the whip and not the beaters. 4. When the egg whites are done, fold in the cooled chocolate slowly with a rubber spatula by adding the chocolate to the egg in 3 or 4 batches. 5. Fold the egg/chocolate into the cream. Lots of folding going on here. Much easier than folding fitted sheets. Hahah. 6. 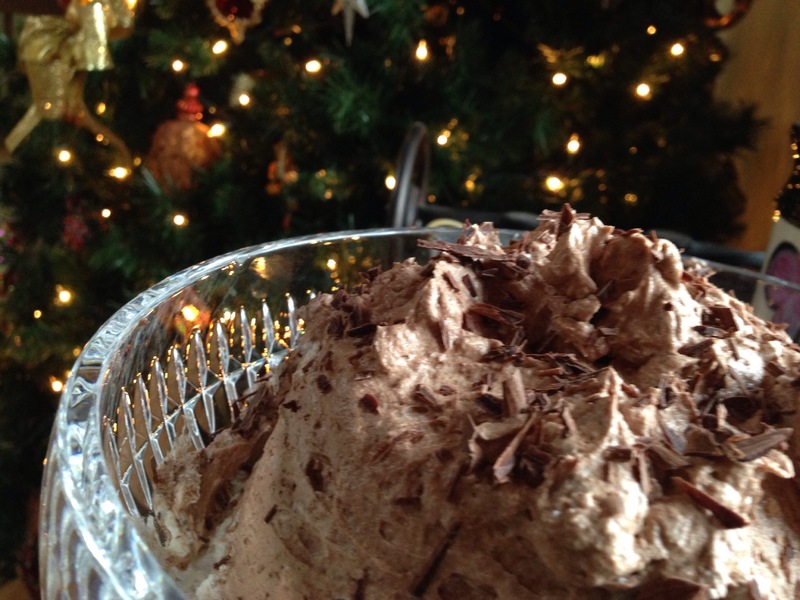 Put this lovely mousse into a large serving bowl (pictured) or directly into individual serving bowls like nice stemmed glassware or small dessert bowls. Refrigerate until ready to serve. This is a remarkably sturdy dessert despite its seemingly delicate nature. It can be made ahead and kept in the refrigerator for 24-hours before your dinner party, for example. When you’re ready to serve, you can shave a little more chocolate on top (which I don’t recommend, see intro) or top it with some fresh berries or fruit sauce, whipped cream with a bit of raspberry liqueur infused into it or any number of things that make it your own creation. It is also quite elegant as is. Save room for seconds, you’ll want them. A Sunday morning breakfast isn’t complete without a warm bread. What can be better than a bacon cinnamon roll? Well, nothing really. And this is easy. This recipe is for the kids and bacon lovers in your house. You will be a hero and it is so incredibly simple, most of the work is done for you if you buy the Pillsbury rolls in a can. I do this because I have a gluten-free kitchen. That being said, I do not make the rolls myself so that I don’t accidentally have any flour get loose and cause problems. 1. Preheat your oven to 325 degrees. Line a baking sheet with parchment paper (or foil) and place a rack on the baking sheet. Pre-heat. When the oven and rack reach 325 degrees, carefully place your slices of bacon on the rack being careful not to overlap the bacon. Pre-bake for about 20-25 minutes. You do NOT want to crisp the bacon at this time, but you want it on the verge of being done. 2. Remove from oven and drain on paper towels. When cooled, cut each slice of bacon into thirds. 3. Ready a clean baking sheet for the rolls by lining it with parchment paper. Unroll the cinnamon buns and place a piece of cool, drained bacon in the center. Re-roll and place on your baking sheet. 4. Follow the directions on the cinnamon bun can and bake. When the rolls are removed from the oven, allow to almost cool completely before adding the icing, if you are going to ice the rolls. We don’t, but it is just a delicious if you do. NOTE: Gluten free baking is tricky, at least for me. Sometimes the difference between a great dessert and one that is destined for the trash is the brand of gf flour used, but many times technique is important. This cake recipe originated at Saveur, but pay attention to the instructions. As I learned after making this cake no less than a dozen times, the little things matter and I’m sharing with you the ones that worked. By the way, if you don’t tell anyone this cake is gluten-free, they will never know! It’s that good. 1¾ cups sugar SIFTED – esp. if using gf flour. *Sometimes I use my orange marmalade instead (pictured). Cook it to soften, then use as the glaze. May need to add a bit of unsalted butter. 1. Heat oven to 325°. 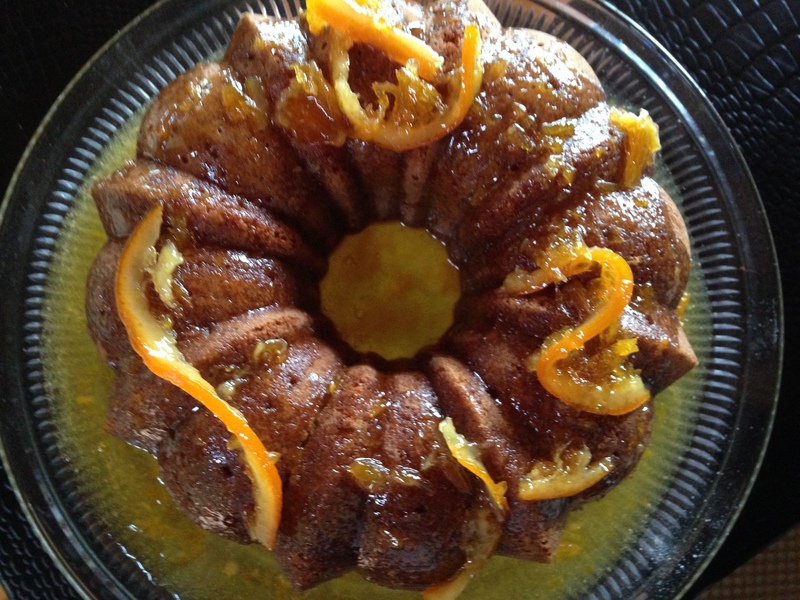 Grease and flour (I use almond meal instead of flower, it give it a nice nutty flavor) a 10″ Bundt pan; set aside. Whisk together flour, 1¾ cups sugar, milk powder, cornstarch, baking powder, and salt in a large bowl; set aside. Whisk together ½ cup rum, milk, oil, vanilla, and eggs in a medium bowl until smooth; pour over dry ingredients, and whisk until just combined. Pour batter into prepared pan, and smooth top; bake until golden brown and a toothpick inserted in the middle comes out clean, about 1 hour. Let cool for 20 minutes, and then unmold and let cool. 2. Bring butter, remaining sugar, and ¼ cup water to a boil in a 2-qt. saucepan over high heat; cook, stirring to dissolve sugar, for 5 minutes. Remove from heat, zest in the orange if using, and stir in remaining rum slowly, very slowly – this will cause the hot liquid mix to boil violently, be careful and you can allow it to cool for a minute or two before adding the rum. Place cooled cake, top side down, on a wire rack set over a baking sheet, and poke holes all over the bottom and sides. Slowly pour syrup all over cake, letting it soak into the cake as you pour. Do this slowly and several times. It can take me up to 30 minutes to finish the process. Pour, wait 5 minutes…etc. And yes, these nuts are going into the Athletic Training category, too. Why? You ask…well let me tell you. Nuts are a great snack to carry around during the day and candied nuts are even better. For that purpose you might (or might not) want to alter the recipe by cutting back on the sugar, but I don’t really see a reason to. Spread your nuts out on the parchment, try to leave a space between the nuts for even toasting. Place in the oven for about 10 minutes, or until you begin to smell the nuts. You do not want to over-roast, so watch them carefully and check your over frequently after about 5 minutes. The type and size of nut you use will make a difference, so this step is more of a how-to guide. 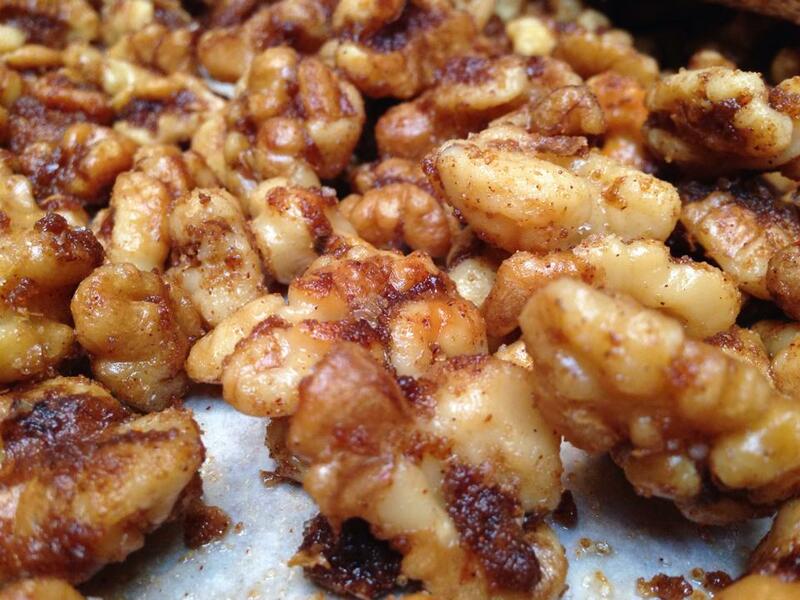 Trust your nose, when you smell the nut, take them out of the oven and set aside. Keep the parchment on the baking sheet, you will use it again, and keep the oven on! If you have a dutch oven, use it. If not, any heavy bottom pot works. Heat the butter over medium low heat. Once melted, add the sugar and all spices. Mix and incorporate. Add the nuts and stir to coat. Keep on the heat, stirring once a minute, for about 4-5 minutes. You are trying to get the spiced butter into all the nooks and crannies while cooking down the butter but keep an eye on it, the slightest burn to the butter and the entire batch will have an awful burned smell….which is not wanted here. Okay, so once the nuts start to dry out and are fully warmed, pour the maple over the nuts and stir. Remove from heat, allow to rest for just a minute. Spread the nuts back out on the parchment lined baking sheet and pop back into the oven. Bake for about 10 minutes, remove from over and let rest on the baking sheet until fully cooled. Enjoy! Smoked chop with the glaze.